Who you take with you gown shopping is a big deal – I’m talking major! These are the people who are going to help you choose the most important gown that you will ever wear. Therefore, picking the right people to go with you on this journey is a must. Here is a list of people that I highly recommend you should bring on your quest for the wedding dress. 1. Your mother. For me this one is a no-brainer (plus my mother would kill me if I went without her). Your mother brought you into this world so it is pretty much her given right to accompany you gown shopping. Plus, for most brides, if anyone’s opinion on choosing the dress matters, it’s their mother’s. Your mother also most likely has a lot of good advice to give you during this process if she has done this before. She is usually the most honest in the group and can also give wonderful insight into what the older crowd will be thinking upon seeing you in the dress. Not to mention those wonderful tears she will shed once she finally sees you in “the one!” Pro tip: If you are on good terms or would like to be on good terms with the mother-in-law, invite her as well! It’s just a nice courtesy that she will appreciate and treasure. If for whatever reason your mom is unable to come or your relationship with her is less than stellar, feel free to bring a someone who has been a mother-like figure to you. 2. Your maid of honor. This person usually holds this honor because they are your closest confidant (other than your significant other) and if anybody knows you and what you like – it’s her! Your maid of honor should have a clear idea of what you are looking for in a gown and be dedicated to helping you find the gown of your dreams. She is there for emotional support, honest opinions, and to back you up if your mom is trying to make you look a little too covered up on your wedding day (unless that’s your thing). The maid of honor is your best friend and she is there and ready to help! Pro tip: if your maid of honor cannot make it for whatever reason, Facetiming and sending photos are great substitutes. 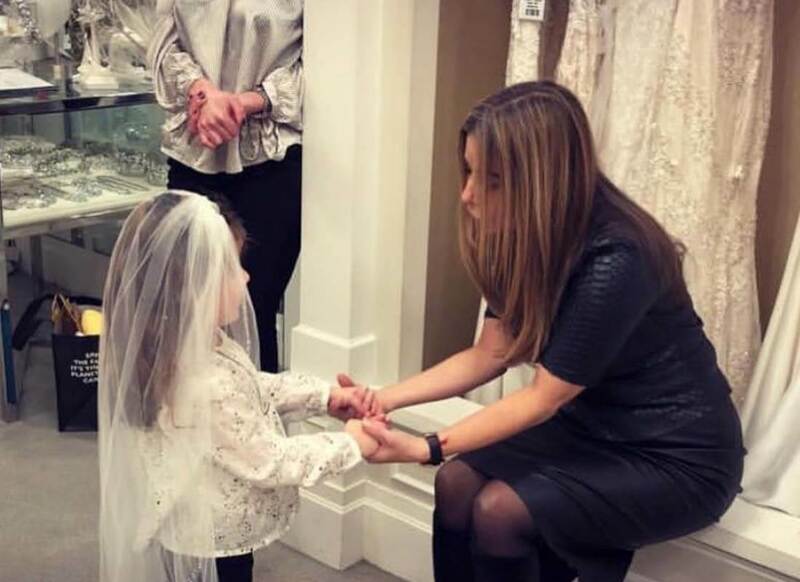 It’s not the same, but it’s still a great way to get her valued opinion on the gowns you try on. 3. Your stylish friend. Now I know this seems bizarre but trust me, you want this friend at your gown appointment. We all have that friend in our group who is more into fashion and stylishly inclined than the rest of us. 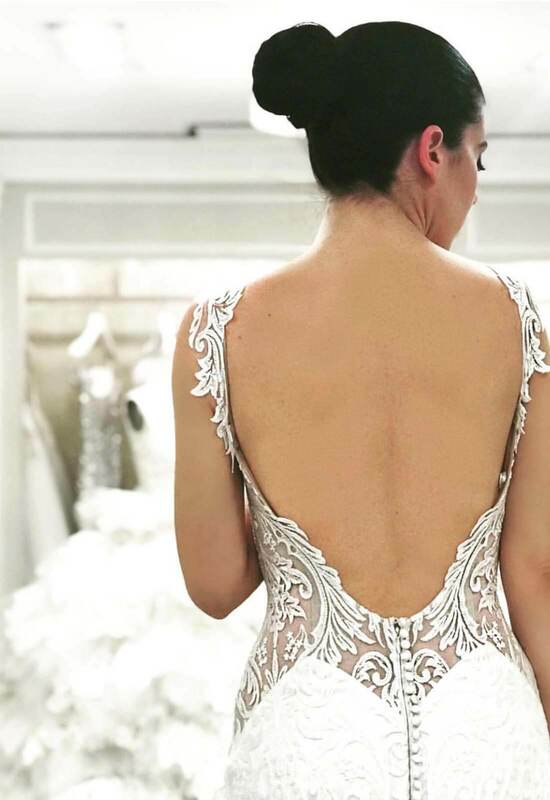 The reason you want this friend at your appointment is because he or she can envision and bring together the criteria you want in your dream dress and help you pick out designers, silhouettes, and accessories to help bring your vision to life. I know you're probably thinking “isn't that what consultants are for,” but this friend is like your wonderful mouthpiece. 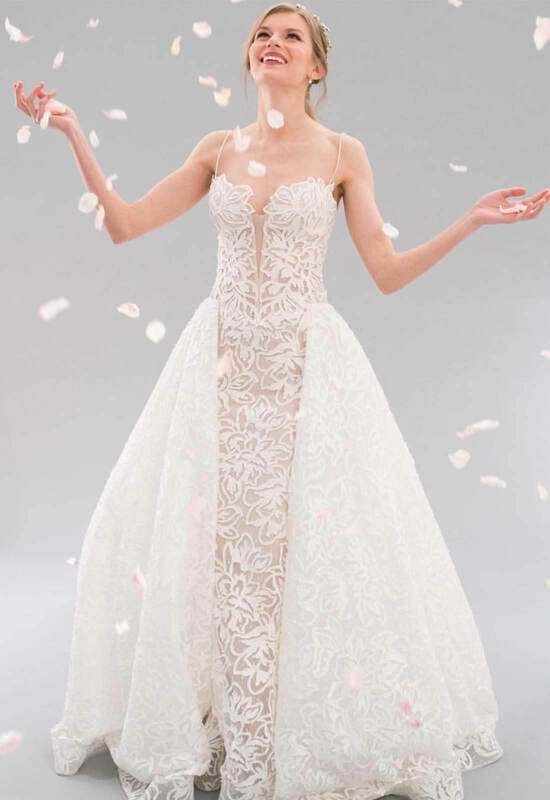 They know all the gown jargon and can help verbalize what you are looking for to the different consultants you encounter as you progress in your gown shopping journey. 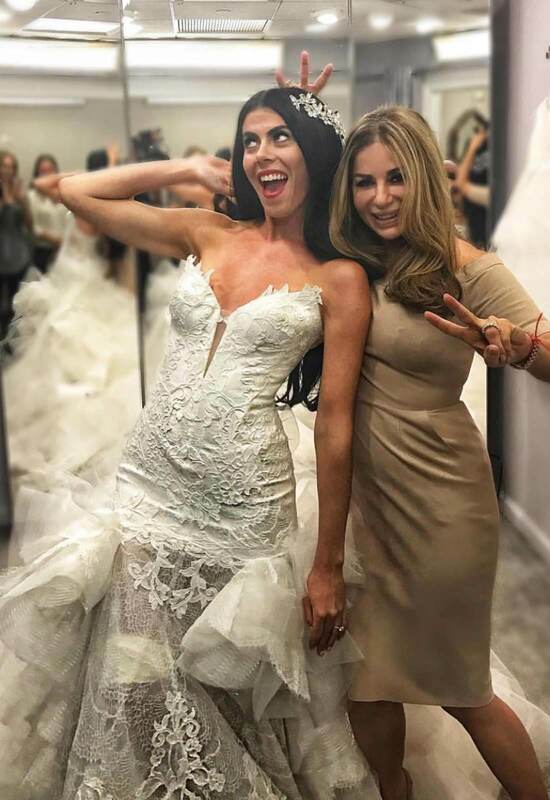 Consider this friend your wedding dress shopping ambassador, there to bridge the gap between you and the consultant and to tell you when you look absolutely fabulous or when it's time to move on to the next dress. 4. Last, but certainly not least, your wildcard. This person is there for whatever reason you want and while they may not contribute much to helping you choose the dress, you just couldn't imagine gown shopping without them. Maybe it's your dad who really wanted to go or that sweet friend that always makes you feel good no matter what. I am saying if you want them there, bring them! Sometimes we just want certain people there and that is ok. Just don't have too many of these (that's why I said ONE wildcard) because things can get a bit confusing and out of hand. Gown shopping is and should be a wonderful and exciting experience for you. Choosing the right people to join you on this adventure is crucial to your shopping success (trust me, I know). This little list should contains the perfet amount of people to bring with you, although if you choose to add more to your posse just remember that too large a party could equal choas. 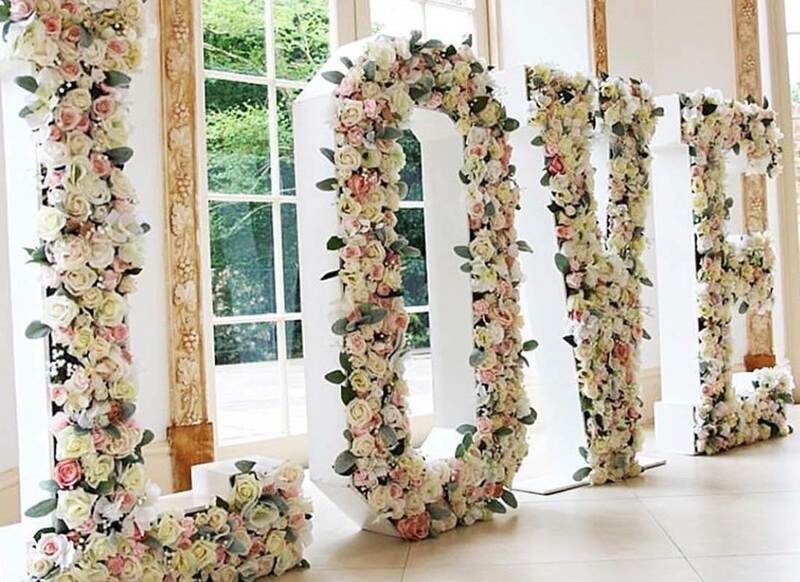 Keep your party small and intimate so that everyone else is surpised when they see you walk down the aisle in all of your bridal beauty and your shopping posse can relive that moment of when you said yes to the dress.